Elton Stubblefield, the son of Travis and Louise Stubblefield, grew up in Denton, Texas, where he was baptized in 1948. He learned to lead singing in the Welch Street Church of Christ, where he met and married Gail Ellis while they attended North Texas State University. After he graduated with a B. S. Degree in Biology, they moved to Madison, Wisconsin where Elton studied cancer research at the University of Wisconsin to obtain a P.hD. 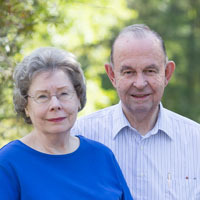 After a year of postdoctoral study in electron microscopy in Germany, he and Gail moved to Houston, where they became members of the West University Church of Christ in 1963. There he led singing and served as a Deacon, an Elder, and Bible School Director over the next 29 years. Elton and Gail have a daughter, Susan, who lives in Maryland with her husband Roger Fulwiler. Dr. Stubblefield was a research scientist at the University of Texas M. D. Anderson Cancer Center from 1963 to 1990 and a Professor of Genetics in the Graduate School of Biomedical Sciences from 1969 to 1990, when he retired. While conducting studies in chromosome structure and function, he also taught graduate courses and served on advisory committees for about 50 graduate students. He supervised eight Ph.D. students in his laboratory, directing their dissertation research and helping them begin successful research careers. His research in chromosome isolation and sorting contributed to the establishment of the successful Human Genome Program. Elton Stubblefield has had an extensive teaching career that includes about 60 years of experience in teaching adult Bible classes in the Church of Christ. He currently serves as an elder at Woodland Oaks Church of Christ.